Remember that time it looked like lunchtime indecisiveness would be a thing of the past? Then it was all taken away from you because that Panera Double Bread Bowl was only available in Philadelphia? 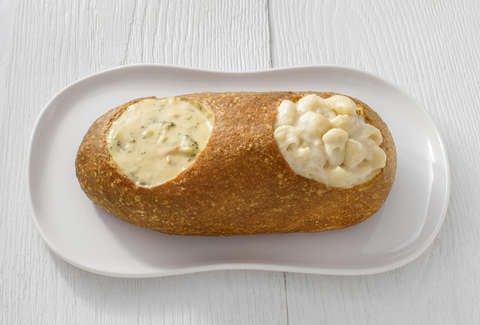 Well, the Double Bread Bowl is finally getting a nationwide release. And it comes at a perfect time. The bread bonanza will be released just in time for Valentine's Day, in case you're looking for a soup-er lunch date idea. 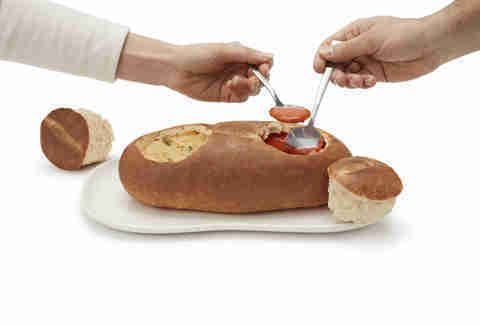 It features two structurally-sound bowls carved into a single loaf of bread. You can mix and match menu items inside the loaf starting February 14 when the visually pleasing and edible dish hits restaurants across the country. What can you put in a Double Bread Bowl besides your hopes and dreams? That's up to you. The announcement says there are 91 possible combinations. Buck the trend and go with double the soup. Load it up with tomato soup and french onion. Or have broccoli cheddar soup with some mac and cheese. Or, if you're a Batman fan, you can order the Oswald Carblepot* and get two orders of mac and cheese. * That's made-up, but this order should definitely be called that.